The crisis in Yemen has become catastrophic. Since the beginning of the Saudi-led coalition’s airstrikes on March 26, violence in Yemen has escalated significantly, leaving the nation decimated with little to no hope for an end in sight. 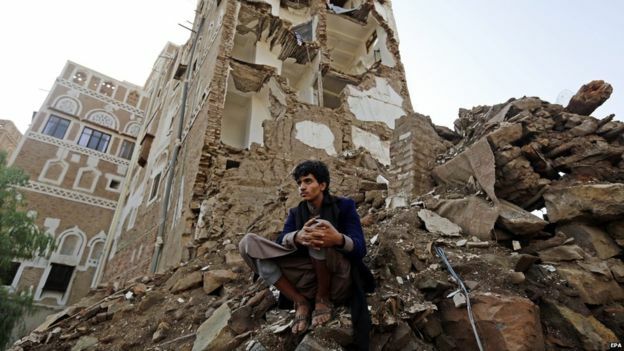 The Saudi-led coalition, backed by the United States, has been bombing Yemen for five months in order to quell the Houthis, a Shia rebel group that staged a coup to exile President Abdrabbuh Mansour Hadi and take over the capital city of Sanaa. Violence between forces loyal to exiled President Hadi, including indiscriminate airstrikes staged by the Saudi-led coalition, and Houthi rebel allies has left nearly 4,500 people dead and 23,000 injured in the past five months. Hadi supporters and Houthi allies are not the only groups perpetrating violence in Yemen. The US government continues to provide intelligence, weapons and midair refueling to coalition aircrafts. Furthermore, US warships have participated in the blockade in the Gulf of Aden and the southern Arabian Sea in order to impede the Houthi forces from receiving weapons shipments from Iran. Both Iranians and Houthis deny that such an exchange is occurring. When asked about US involvement in the massacre of Yemeni civilians, Cmdr. Kevin Stephens, a U.S. military spokesman in Bahrain, stated, “The final decisions on the conduct of operations in the campaign are made by the members of the Saudi-led coalition, not the United States.” This is a clear attempt to take away any responsibility and accountability the US has for the thousands of Yemenis who have been killed since coalition airstrikes began five months ago. Peter Maurer, head of Red Cross international, told the AP that “Yemen after five months looks like Syria after five years” after returning from war-torn Yemen in August 2015. The increase in violence since March 2015 has exacerbated the existing issues that have plighted Yemen for years: poor governance, lack of rule of law, widespread poverty, and insufficient access to basic healthcare and water, among others. The Saudi airstrikes against rebels have effectively destroyed Yemen’s infrastructure and have resulted in rigid restrictions on imports. According to Oxfam, Yemen relies on imports to meet more than 80% of its national food consumption; even before escalation occurred, approximately half of the population—10 million Yemenis—was already going hungry. The situation has grown more grave, as 20 million people are now in need of water and sanitation assistance and 15 million lack access to basic health care. The Saudi-led coalition’s carnage of Yemen has impeded humanitarian access that would help ameliorate the crisis. The strict restrictions on food and fuel imports—compounded by lack of funding humanitarian organizations have for sending relief to Yemen—leaves Yemen virtually helpless. Meanwhile, Amnesty continues to report on Saudi-led coalition’s unlawful airstrikes which often target heavily populated civilian areas with no military targets nearby. Amnesty shares multiple case studies of hundreds of innocent civilians being killed by coalition airstrikes, often times the majority of the victims being women and children. It seems, however, that it is not just the Saudi-led coalition displaying a blatant disregard for civilian lives. On the ground, both Houthis and anti-Houthi PRC armed groups have killed and harmed civilians in their quest for the cities of Aden and Ta’iz—the majority of the attacks being aimed at neighborhoods. Therefore, whether it be airstrikes or on-ground fighting, the result appears to be the same: the loss of civilian lives. The most recent Saudi-led airstrike occurred on Sunday, August 30, at a water bottling factory, leaving 36 dead and dozens injured. Saudi Brig. Gen. Ahmed Asseri, a spokesperson for the Saudi-led coalition, claims that the factory was being used by Houthi forces to make explosives and train African migrants forced to take up arms. However, residents and medical officials state that the 36 people killed in the bombing were civilians. Although confusion still remains surrounding the recent bombing, one thing remains clear: the bombings are continuing rampantly as the crisis in Yemen rapidly deteriorates. Michael Avender works at CODEPINK and is a student from Northeastern University studying Human Services and Women's, Gender and Sexuality Studies.